You can easily reply to any discussion, threaded or focused. However, the reply process varies depending on the type of discussion. 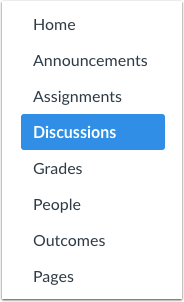 Note: The discussion reply Rich Content Editor includes a word count display below the bottom right corner of the text box. To reply to the main discussion, type your reply in the Reply field. Write your response in the Rich Content Editor . You can add links, photos, equations, and/or media. You can also attach files . Once you finish, click the Post Reply button . Your reply will be posted at the bottom of the discussion reply thread. The border of your post will flash blue indicating it has been newly posted. The dot indicator next to your post will immediately show an outline icon if Canvas automatically marks your posts as read. However, if you manually mark your posts as read, the indicator will remain a solid dot. 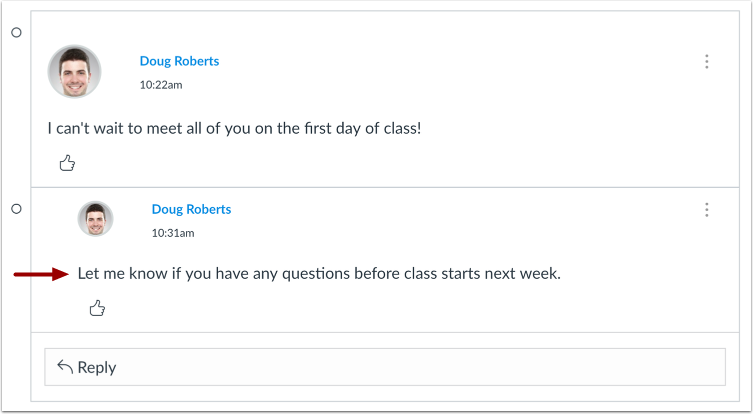 In a focused discussion, you can reply to a comment already posted by another student by clicking in the reply field below the post. Your reply will be posted at the bottom of the discussion reply thread. The border of your post will flash blue indicating it has been newly posted. The dot indicator next to your post will immediately turn white if Canvas automatically marks your posts as read. However, if you manually mark your posts as read, the indicator will remain blue. 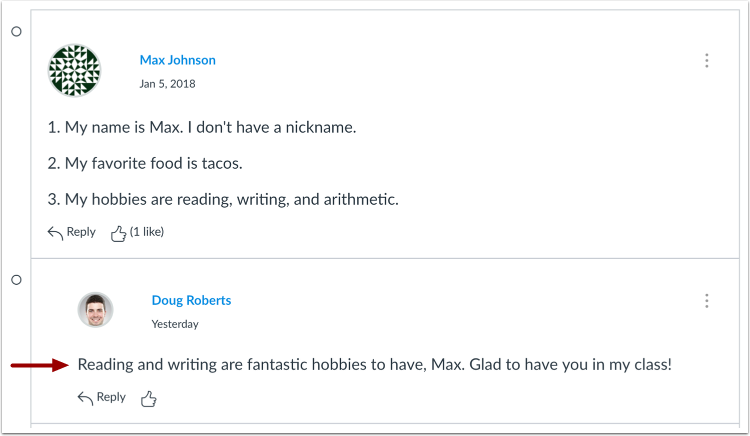 In a threaded discussion, you can reply to a comment already posted by another student. Locate the post you want to reply to and click the reply icon. Your reply will be posted at the bottom of the discussion reply thread. The border of your post will flash blue indicating it has been newly posted. The unread icon next to your post will immediately change to the read icon if Canvas automatically marks your posts as read. However, if you manually mark your posts as read, it will show the unread icon until you manually mark the post as read. Previous Topic:How do I assign a graded discussion to a course section? 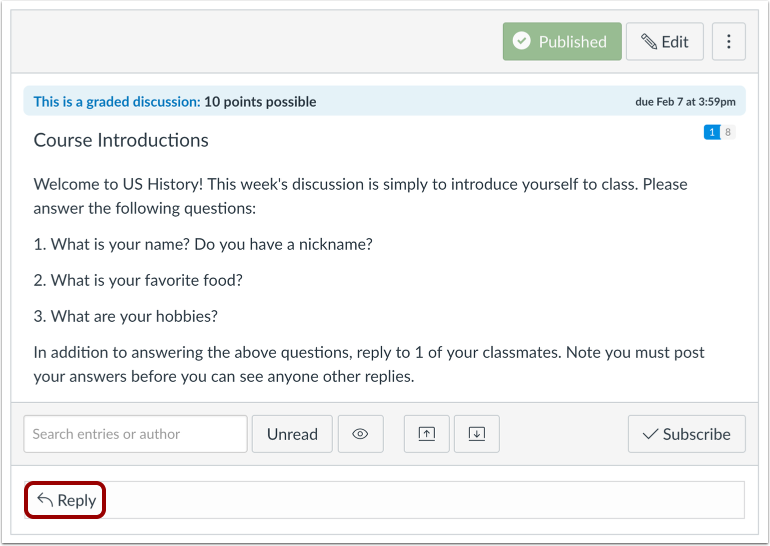 Next Topic:How do I view and sort discussion replies as an instructor? Table of Contents > Discussions > How do I reply to a discussion as an instructor?